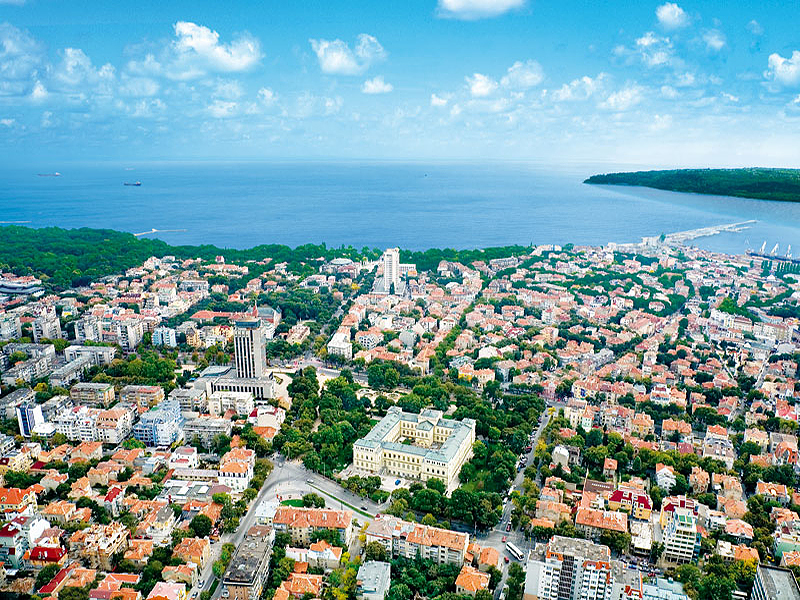 Rousse is the largest Bulgarian city on the Danube river, the most significant river port. It is located in the north-eastern part of the country, at 320 km from the capital Sofia and opposite the Romanian city of Giurgiu. The Rousse-Giurgiu Friendship Bridge, until 14 June 2013 the only one in the shared Bulgarian-Romanian section of the Danube, crosses the river here. The town was founded at the time of the Roman emperor Vespasian over the period of 69 - 79 AD as a fortress called Sexaginta Prista, meaning Harbour of the Sixty Ships. The Roman fortress existed up to the 6th century when the Avars brought it to ruins. 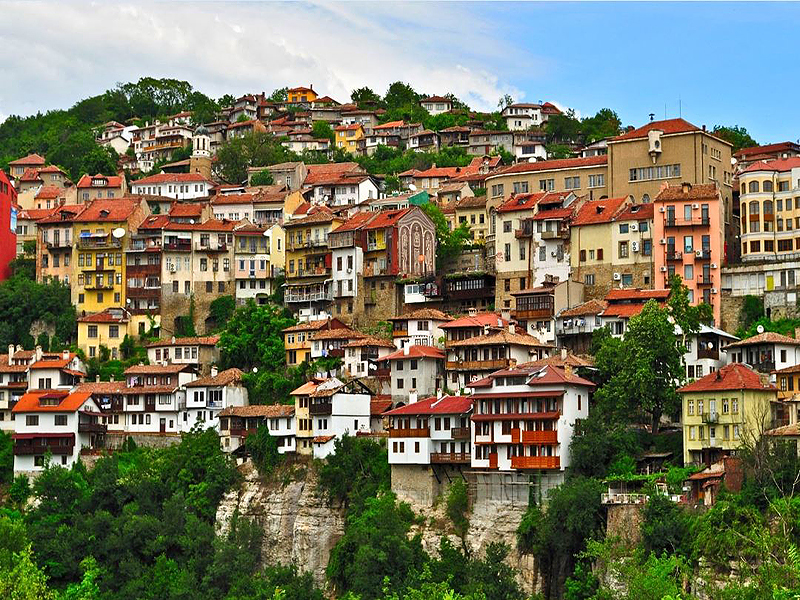 In the Middle-Ages the region of Rousse was among the most developed areas of the Bulgarian state. At the time of the Ottoman Yoke, Rousse (Rouschouk) was an important fortress and the main gate to the north of the Turkish Empire. In the 19th century, as part of modern Bulgaria (20 February 1878), Rousse was the first town in Bulgaria to acquire a pronounced European look. The connection with Europe through the Danube river was favorable for development of Rousse. The city is known for its Neo-Baroque and Neo-Rococo architecture. Due to the beautiful architecture and the internal shaping of the buildings constructed by Italian, Austrian, German and Bulgarian architects, Rousse was also known as 'The Little Vienna' . The ‘nickname’ was given not only for the architecture but for its economic and cultural prosperity at the turn of the century. The first newspaper printed in Bulgaria came out in Rousse in 1865. First of its kind in the Balkan Peninsula, the building of the railway from Rousse to Varna in 1866 largely contributed to the growing significance of the town. The first public pharmacy and the first bookshop in Bulgaria were opened in Rousse. The first Bulgarian teachers' association was set up here in 1871. After the Liberation in 1878, still one of the largest towns in Bulgaria, Rousse became the cradle of the Bulgarian shipbuilding when the first iron ship was built in 1881. The first Bulgarian private bank (Girdap), with authorized capital of 5 million golden francs and the first Bulgarian insurance company (Bulgaria) were established in Rousse in 1881. 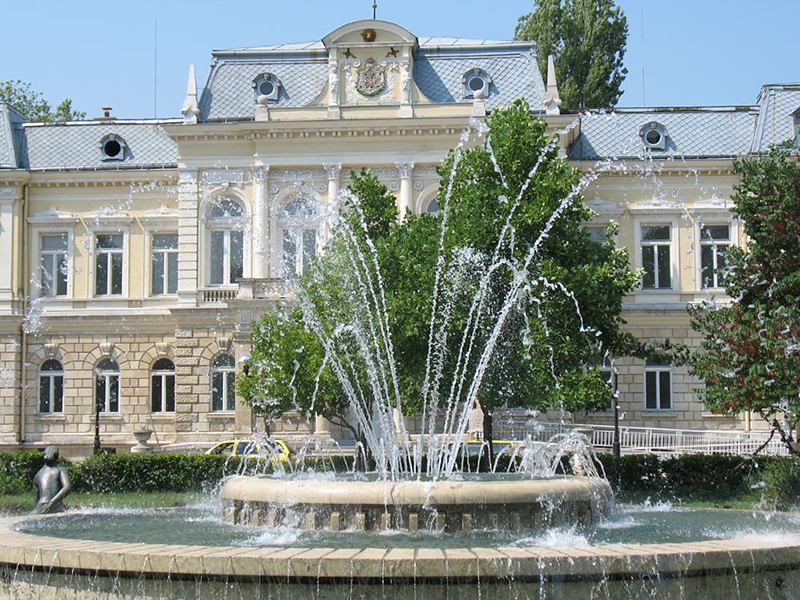 The first Bulgarian Chamber of Commerce and Industry was established in Rousse in 1895. In 1897 just two years after the show of the Lumiere brothers in Paris, the residents of Rousse were the first to see the motion pictures. 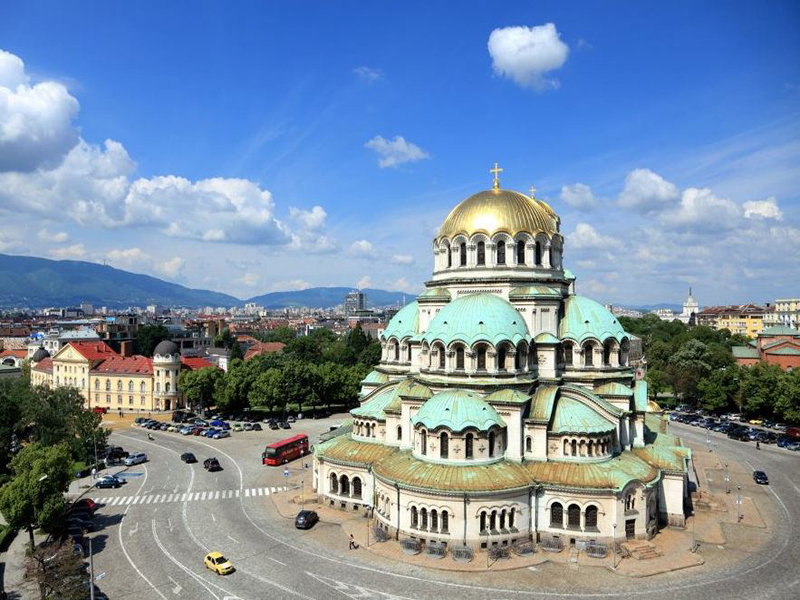 The second was a month later in the capital Sofia. Rousse is a city where cultural influences from West and East, North and South meet and take roots. The people living here perceive Rousse’s identity as a bridge between cultures. Even today the Danube River is a basic factor for the development not only of Ruse, but for all of Bulgaria. The Danube Bridge by Rousse has a strategic importance crossing the river by automobile and railway transport. 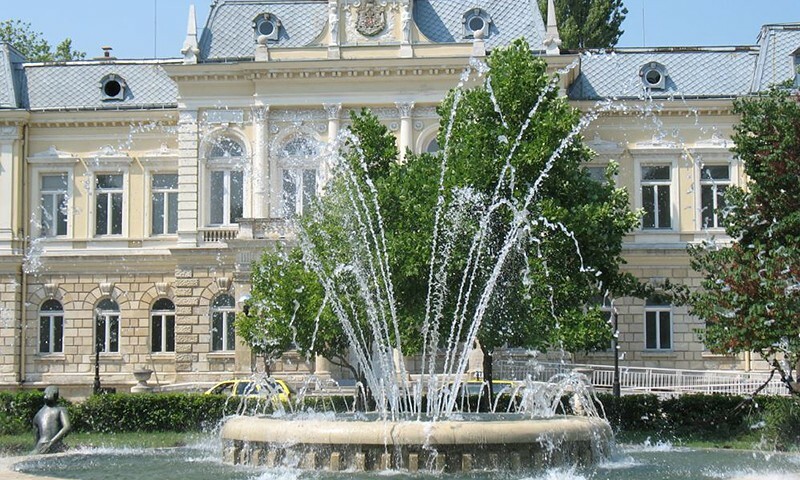 A symbol of the richness of the Danube area, in partnership with its Romanian sister-city Giurgiu, Rousse is determined to establish itself as European center and leader of cross-border co-operation. The Statue of Liberty (1908), emblematic for the city, was built by the Italian sculptor Arnoldo Zocchi to commemorate the 30th anniversary of Bulgaria’s liberation from the Ottoman oppression. 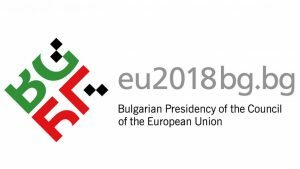 The woman figure represents free Bulgaria. Nowadays, it embodies the determination of its citizens to defend their freedom and civil rights as a supreme European value and energy for constructive change. They were the ones who started the civil protests against the totalitarian communist regime, which initiated the democratic changes in Bulgaria. One of the city symbols is the Profitable Building – an imposing Neo-classical edifice in the center of Rousse. It was constructed in 1898-1902 and impresses the visitors with its wonderful façade and the 7 figures on the roof. They are a symbol of arts, science, music, agriculture, commerce, defense and the free spirit flight. On the top is the symbol of commerce – Mercury. Now the building accommodates the Rousse Theatre and offers its stage to variety of performances. Rousse is the most active and authoritative cultural center on the lower Danube and the host-town of many significant annual cultural events. As early as the 19th century in Rousse there began to be formed temporary opera, choral and symphonic troupes resulting from the serious contact with the European music culture. The brightly colored Rousse Opera House (1949), situated in the city center, at the end of the pedestrian street, accommodate various types of performances, from ballet to concerts. Rousse is famous for its beautiful parks, favorite places for recreation for people of any age. The biggest park in the city had different names in different times: Said Pasha's Garden, Bishop's Garden, Park of Freedom, Park of Youth. The most emblematic place in the park is The Vase - the metal structure shaped like a vase, filled with soil on which flowers are planted. The size of the vase is remarkable - the height is 3.40m., the width is 7m. Close to it is the rockery, a combination of steep paths and caves made of crashed stone. The only National Museum of Transport in Bulgaria is situated in Rousse, which is housed in the building of the first railway station (1866) in Bulgaria. Old locomotives and wagons stay on the platform in front of the station, including the first locomotive from 1866. Among the most interesting exponents of the museum are the wagons of the Tsars Ferdinand (1887–1918) and Boris ІІІ (1918–1943), and also the lounge wagon of Sultan Abdul Aziz (1830–1876). There are three halls in the museum, displaying the history of railway transport and shipping in Bulgaria. The remarkable and unique archeological reserve Ivanovo Rock-cut Monasteries is some 23 km south-west of Rousse. Located high in the rocks, 40-50m above the ground, the cells have been inhabited by monks until the 17th century. Chronicles and preserved church murals show that during the 13th - 14th centuries the community of hermits created a flourishing literary center. The rock monasteries have been evaluated as an important stage in the development of the European culture, and have been recorded on UNESCO's World Cultural Heritage List. The Ivanovo churches contain some of the best frescoes of the Bulgarian religious art.